I first posted these Vampire Donuts A Quick and Easy Treat For Halloween, a few years ago. We have made them every year since then. We have improved or changed the recipe or creation process a little. So I thought I would update the post and share the new and improved version of our Vampire Donuts A Quick and Easy Treat For Halloween with you. Printable version below. 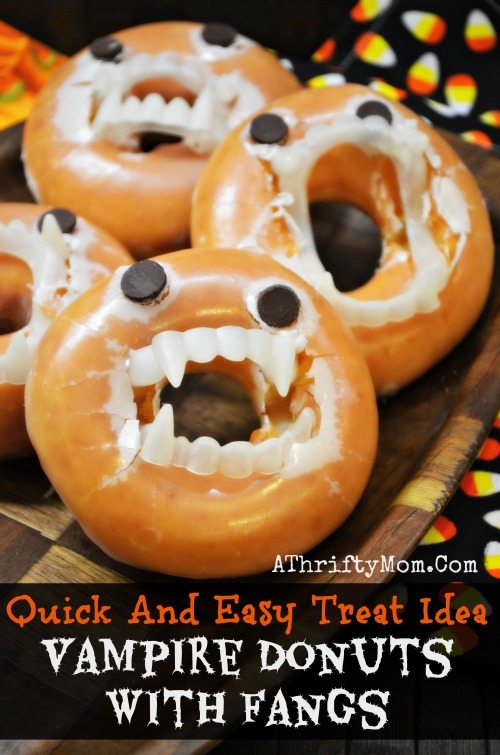 Are you looking for a fun treat idea to bring to your kids school or a Halloween party? My mother-in-law made these for my kids and they absolutely adored them. In fact 6 year old squealed with joy when she opened the lid of the donut box and saw these looking back at her. I love that anyone can make these, but they turn out so cute every time. We have made them with Krispy Kreme donuts as well as bakery donuts, they all work. You just have to make sure they have a hole in the middle to put the teeth in. Last year was the first time I made them with chocolate and maple frosting and they still turned out! SO do not stress if you can not find glazed donuts. In fact I think the colored teeth add a little character to the plate. My kids call the ones with colored fangs, Monsters and the ones with clear teeth Vampires. Squish the vampire teeth together and press them into the middle of the donut hole. Pick your eyes, Chocolate chips, M&M’s or Candy Eyes and press them into the donut. Simple as that you have a treat that is sure be a hit! Really even my 6 year old could make these, and they would still turn out cute! 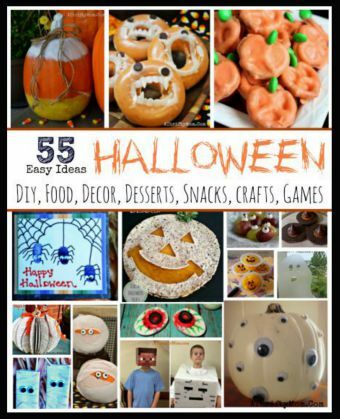 Are you looking for a fun treat idea to bring to your kids school or a Halloween party? My mother-in-law made these for my kids and they absolutely adored them. In fact 6 year old squealed with joy when she opened the lid of the donut box and saw these looking back at her. I love that anyone can make these, but they turn out so cute every time. We have made them with Krispy Kreme donuts as well as bakery donuts, they all work. You just have to make sure they have a hole in the middle to put the teeth in. Last year was the first time I made them with chocolate and maple frosting and they still turned out! SO do not stress if you can not find glazed donuts. In fact I think the colored teeth add a little character to the plate. My kids call the ones with colored fangs, Monsters and the ones with clear teeth Vampires. Next articleBuffalo Plaid Jogger | S-3X for $25.99 (was $49.99) 3 days only. Kyston Sedillo this is cute!! I assumed the teeth were the cheap plastic ones. Denise Cross Francis, bet little dude would like these! I clicked on the link for the teeth and it just went straight to the amazon homepage. The only edible vampire fangs on amazon are the red lip wax ones. Unless these don’t use edible teeth? Are the eyes choc chips? Party food idea Chase Kirkpatrick?? This is just making me want krispy kremes.